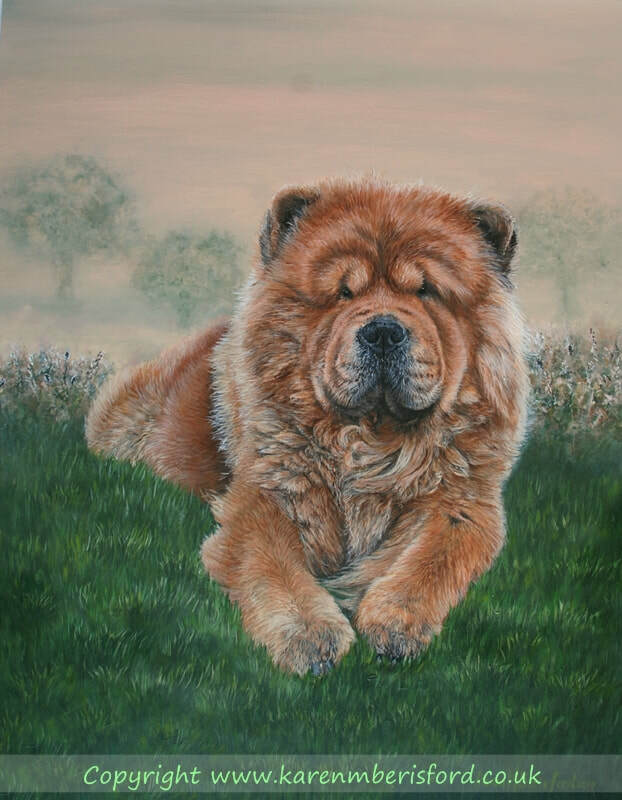 I was given some beautiful photographs of Star which allowed the Commissionee to upgrade her Gift Voucher purchased for a 12" x 16" up to a 16" x 20" size due to the quality of the images. A tonal background was chosen to avoid overpowering Star. There is lots of fine detail which allowed for high impact in the final painting. 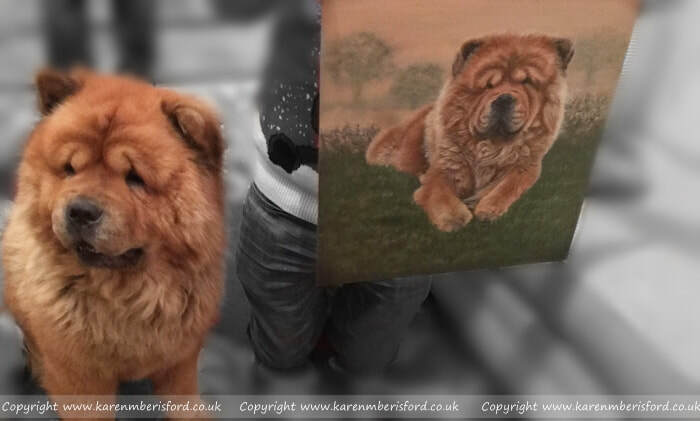 Firstly the background is roughly applied and the base layers are laid down on the dog. This is followed up by defining the background a little more and the finer detail is begun starting with the face. I decided to build up the right side and keep the left side loose in the beginning purely to use this for promotion ads showing how details are built up. The rest of the face is then defined before working on the rest of the body. The refining process is then begun which sees the really fine hair being built up over the top of the earlier defined areas and before placing the outer edges, I will build up and finalise the background and foreground detail. The final stage is the tweaking where everything is balanced out and finishing with the whiskers before applying a coat of UV satin varnish to protect. 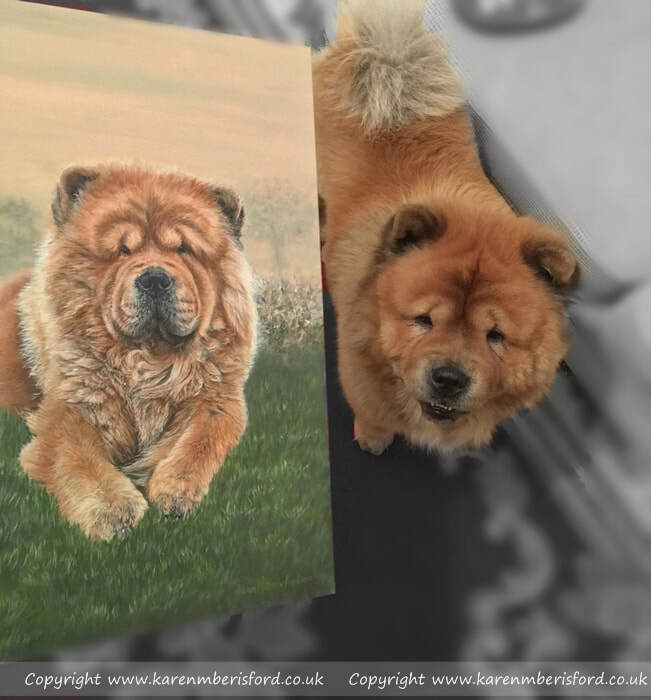 I always love to see photos of Pets and their Portraits and I was sent a few photos of Star beside his portrait on the day the painting had been gifted for Christmas. It's never easy getting your pet to sit or stand next to the portrait and so I really appreciate these photos. Hasn't he got a lovely smile!